Exit signs with no end in sight. Part of the superb new work at Tenderpixel. Just back from Tenderpixel, the compact gallery hidden away on Cecil Court, a tiny walking street, a stone’s throw from Leicester Square tube. Is this London’s most central gallery ever? What we got was a rather sublime show. A wall of exit signs set at a diagonal in the upper gallery; the shoe-size boxes that contained these signs are piled high in the front window blocking the view to those outside. But these boxes have magnets on the back, which in turn are connected to magnets on the window outside. Visitors are encouraged to move the boxes using the magnets outside causing some to move, ever so slightly. In the lower gallery, more electrical guts from the exit signs are arranged somewhat randomly in a dimly lit area. 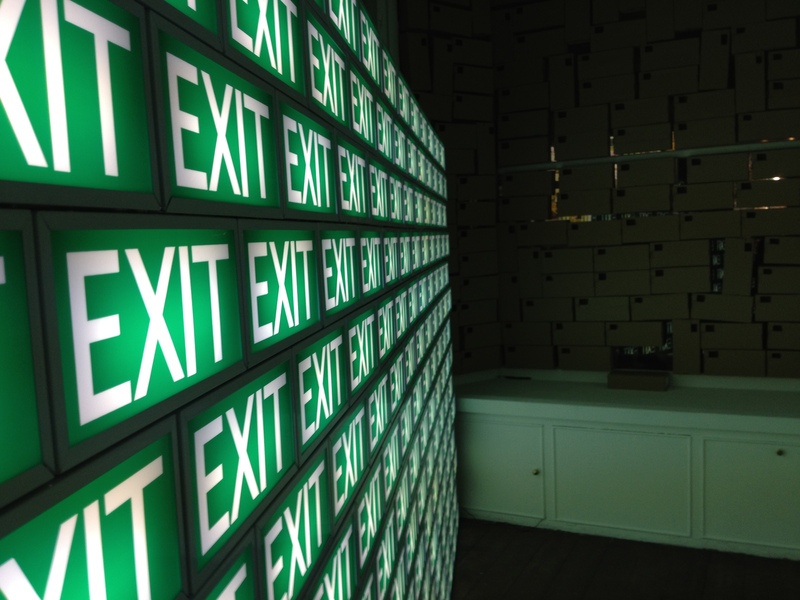 The word ‘EXIT’ and its cool Pantone 356 green background are seared into our consciousness. It’s an ending, or a beginning. It’s a prop from a serious establishment; a life-saver; an annoyance. One day it might be one of the relics of signage of a retail store that lost its way, or that was burnt down in a riot. We entered the show and now we have exited. We are outside. Someone has found a way to reverse a magnet so that it makes some of the boxes in the window pop out of place, and, like a pack of cards, many boxes fall. The perpertrator of this art crime doesn’t know if he will shortly be marched unceremoniously from the gallery frontage, or hailed as an art hero in an interactive work that craves his interaction. The creators of the work are filming him. So it’s all good. He’s a hero then. he hasn’t been EXITED. The cardboard wall is almost demolished, the bright lights of the EXIT signs laid bare behind the glass window. The artists and friends disappear into the night. EXIT. Art made us curious again. Hooray. We also had some fun seeing the boxes come tumbling down, so it made us laugh too. This was no EXIT. This was a beginning of a artistic relationship with the enigmatic Colle-Nuhn partnership. This entry was posted in Art, Review and tagged Gallery by Ken Young. Bookmark the permalink. Thanks, Ken, for this EXCITING and TENDER review! The sense of fun from interacting with the magnets and boxes is great. Yet, the underbelly of this exhibition is sombre. The detritus in the basement interrogates darker questions and the flip side of consumer culture, media art practices, and our dependence on electricity. It shows the waste and detritus of modern life, the stuff that gets left behind when we’re done with them. The spent cables, sockets, light bulbs, and fluorescent tubes; the electric hum that generates negative energy. But once we go upstairs again, we are once again swayed by the brilliance of the Exit wall and the joy of the boxes and magnets.